Opponents will have to wait another year to get an early season win against the Virginia basketball team. No. 4 UVA extended its nation-leading November winning streak to 25 games with a 76-71 victory at No. 24 Maryland on Wednesday night in the ACC-Big Ten Challenge. The Cavaliers haven’t lost in this calendar month since 2015 as they posted their third straight undefeated record in November with the win. The Hoos have won five straight games in this inter-conference challenge. Virginia took control over 15 minutes in the middle of the game and fended off multiple Maryland rally attempts down the stretch. 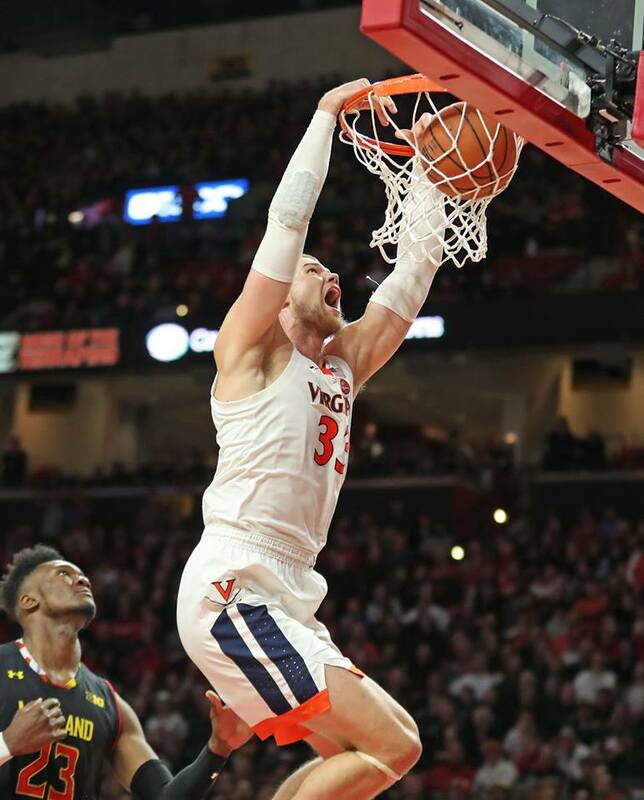 The teams mostly exchanged baskets for the first 10 minutes and UVA held a narrow 18-17 lead before a 16-8 stretch helped the Hoos grow the advantage to 34-25. Three-pointers from Guy, Ty Jerome, and Braxton Key fueled that surge along with another 3-point play from Guy when he got fouled while making a jumper. The nine-point lead remained intact by halftime at 39-30 and Virginia added to it over the first four minutes of the second half. The Hoos came out of intermission with a 9-1 burst thanks to another Guy 3-pointer and two buckets from Jack Salt. That pushed UVA’s lead to 17 points at 48-31 with 16:29 remaining. At that point in the action, Guy already had scored all of his game-high 18 points thanks to 5-of-9 shooting from downtown. The Terps called a timeout to try to stop that half-starting surge and avoided the knockout blow thanks to a pair of 3-pointers that followed. The hosts hung around over the final 15 minutes and got as close as four points twice, but a Salt dunk and a Jerome 3-pointer quelled the comeback attempt in those moments. Including that duo, Virginia placed five players in double figures. Along with Guy’s 18 points, Jerome added 17 points and Salt scored a career-high 12 points to go with a season-high 7 rebounds. De’Andre Hunter posted another strong game with 15 points, 5 rebounds, 4 assists, and 1 blocked shot. Braxton Key rounded out the double-digit scoring contributions with 10 points. Kihei Clark had 4 points and 4 assists. Salt’s line jumps off the page because the senior doesn’t usually chip in so many points. In this game, however, he made 6 of 7 shots thanks to repeated dunks. One of those came on a Hunter assist out of some screen-and-roll action, but most of his rim-rocking plays came through offensive rebounds. He repeatedly shifted his positioning around the charge circle when Maryland’s Bruno Fernando or others tried to slide over to block shots in help defense and then took advantage of the free space to slam home those putbacks. In the end, two significant statistics helped carry UVA to the winner’s circle again. First, led by Guy’s sharp-shooting performance and Jerome’s trio of 3-pointers, the Cavaliers made 10 of 22 triples in their first true road game. That included eight treys in the first half. Maryland faced a deficit in that category for most of the night before a trio of 3-pointers in the final minute closed the gap. The Terrapins made 7 of 17 long-range shots in the game. Eric Ayala and Aaron Wiggins led the hosts with three each as each tallied 13 points in the loss. While the Terps caught up a little bit in the 3-point race, they couldn’t make up ground with turnovers. They committed 14 turnovers and UVA turned those into 16 points. Making that many miscues is tough to overcome, but it gets even tougher when the opponent takes care of the basketball on the other end. That’s what the visitors did in this one. The Hoos committed just two turnovers all night and both of those came on offensive foul calls. They’ve finished with five or fewer turnovers in four of seven games. 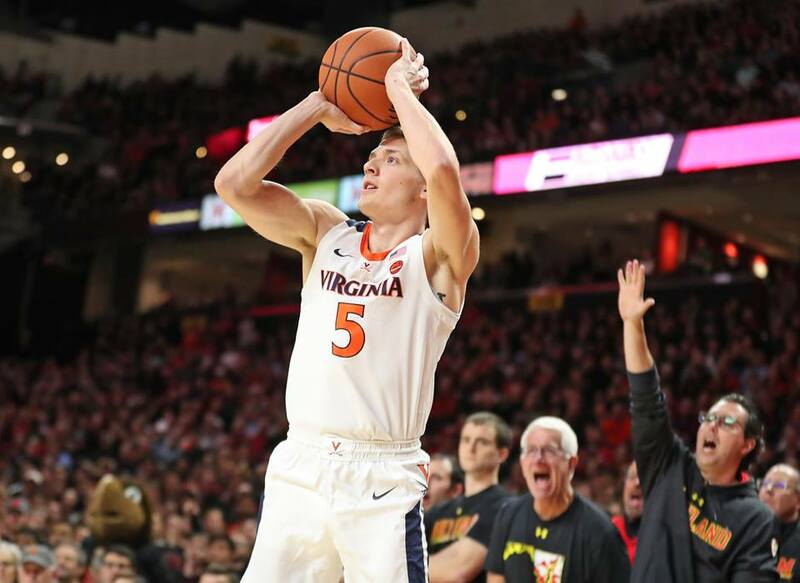 UVA entered the game averaging 8.0 turnovers per game, the best number in the nation, and that trend played an important role in yet another November win.